Lin-Gas has a long history of providing propane power for uses in the construction and roofing industry. This is a specialized area and we know how to get you the proper type of propane power you need and more particularly, WHEN you need it. Roofing and some construction heating applications require liquid rather than vapor withdrawal cylinders. We have them for you. Many applications require specialized regulators, hoses and appliances. Again, we have them in stock so you don’t have to wait. Lin-Gas also carries 125 gallon (affectionately referred to as “PIG” tanks) for heating at construction locations- as well as the heaters that go with them. A construction site requires particular attention to safety. Every single one of cylinders have the collars and required markings on them so you can be confident the propane at your site is in compliance with all the rules and regulations of the industry when dealing with hazardous materials. 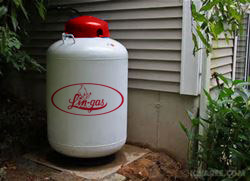 Give Lin-gas Construction Propane Services a call today – we will deliver.